Rediff.com » News » What if it was Haider Pathan and not Hardik Patel? 'If Haider petitions the court and the government for legitimate rights it is called minority appeasement, but when Hardik orchestrates violence he is lionised, romanticised and given huge media space that ends up both legitimising and oxygenating his movement, no matter how contrary it is to the Rule of Law,' argues Shehzad Poonawalla. Hardik Patel is a 22-year-old BCom graduate who comes from an average middle-class Patidar family from Viramgam, near Ahmedabad, Gujarat. Son of a Bharatiya Janata Party leader, he secured less than 50 per cent marks in college and speaks rustic Hindi and Gujarati. 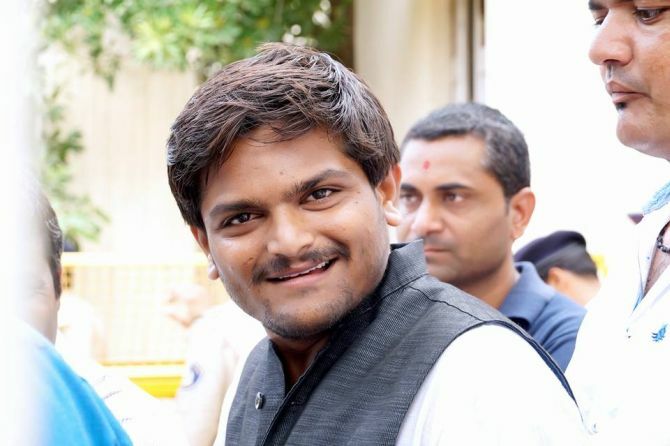 An unknown face till two months ago, today Hardik comes across as a wannabe Raj Thackeray and Arvind Kejriwal rolled into one, and is at the forefront of an agitation of Patels/Patidars to be counted among the Other Backward Classes. The community of generational landowners who worked alongside upper caste Brahmins enjoyed such political patronage that since 1960, the year of Gujarat's creation, the state has had a Patel as chief minister for not less than 12 years -- including the incumbent Anandiben Patel. Having enjoyed the fruits of socio-economic empowerment, the community, claiming backwardness, now demands the fruits of reservations as OBCs. As Tuesday's events proved, these were not empty threats. As soon as the 'young leader' was detained and later released by the police following a massive rally in Ahmedabad in support of the demand for reservations, violence erupted in several areas of Gujarat, particularly Surat and Ahmedabad. Mobs blocked roads and torched buses, after which curfew had to be clamped, but not before three police chowkies had been set ablaze, and the homes of ministers Rajnikant Patel and Nitin Patel vandalised in Mehsana. Haider Pathan, on the other hand, is a 27-year-old Muslim youth who topped BCom from a Pune college, pursued a degree in law despite a modest upbringing and assimilated himself in the secular, cosmopolitan, Nehruvian narrative of India. He can't read Arabic, but speaks Hindustani. Having struggled to create his own space as a civil rights activist without a political godfather, and having lost his father at the age of six, there was an abiding commitment to the Constitutional rule of law and Nehruvian values. There were petitions filed and cases fought in court by him to redress many issues inflicted by the State, but never did he hold out a threat to vandalise public property or issue a call to violence. From housing to education, employment to political representation, discrimination among Muslims is rampant, but he seeks no quota. Just a fair chance and an equal opportunity as promised by the opening lines of the Preamble to our Constitution. One study shows that in the secondary and tertiary sectors, the share of Muslims between 16 and 64 years of age in regular and casual employment is lower than that of Scheduled Castes and Scheduled Tribes. In the public sector, the situation is equally dismal, with Muslims having a share of just 2.5 per cent in the civil services. Today, just four out of 100 Muslims above the age of 20 are graduates. With high dropout rates, high illiteracy rates and limited access to schools and skill development centres, the Indian Muslim is severely handicapped. A Patel may have been Gujarat chief minister for one-fourth of its existence, but since 1982, for the last 53 years, there has been no Pathan, Khan, Ali or Zaidi as the CM of Maharashtra, which was also formed in 1960 along with Gujarat. As a matter of fact, the last time India, other than in Jammu and Kashmir, had a Muslim CM was in 1982, six years before Haider was even born. Some 35 million Muslims live in Uttar Pradesh which sends 80 MPs to the Lok Sabha -- not one of them is a Muslim. The parallel stories of Hardik and Haider are important as they give us a deep insight into everything that is wrong with our system. Those who play by the rules always lose, while those who break them win. And all the time we have sanctimonious right-wing politicians who pontificate to Indian Muslims about how minorities are being suppressed in Pakistan -- as if Indian Muslims can do anything about what other Muslims do in their sovereign country -- but in the same breath refuse to see that the same brand of majoritarianism they complain of, could exist here too with the roles of suppressor and suppressed reversed. When Patels demand reservation that does not get the anti-reservationists riled up, but when Muslims demand affirmative action and scholarships, and that too only for the backward and poor among them based on scientific and empirical evidence as gathered by the Sachar Committee and other reports, we are given all kinds of labels. Those who tweet in support of the Uniform Civil Code say nothing when Jains take to the streets against a court verdict on Santhara. And the most diehard proponents of the Uniform Civil Code are okay with claiming tax benefits as an HUF (Hindu Undivided Family) under the Income Tax Act or support laws against eating one animal because it is against their religious beliefs. The hypocrisy doesn't end there. Those who crib about Article 370 granting special status to Jammu and Kashmir don't talk about the much greater autonomy granted to states like Nagaland and other North-Eastern states under Articles 371-A, 371-B and so on. If Haider petitions the court and the government for legitimate rights it is called minority appeasement, but when Hardik orchestrates violence he is lionised, romanticised and given huge media space that ends up both legitimising and oxygenating his movement, no matter how contrary it is to the Rule of Law. Some television anchors have been speaking of him in such endearing terms as if he has won the Nobel Peace Prize! So think. What if Haider Pathan did what Hardik Patel has done? I am sure half our talking heads on prime time television would have strategically analysed how Pakistan and its ISI have funded him while the rest would diagnose how his 'Islamic beliefs' have led him on a path of jihad and destruction. The truly evolved ones would tweet about Haider being an ISIS agent on a mission to expand the Caliphate. Between Hardik and Haider lies the one word that describes us aptly -- 'Hypocrites,' for whom anything that resembles Haider is worthy of hate and anything that spells Hardik is worthy of being made prime minister. IMAGE: Hardik Patel. Photograph: Kind courtesy, Hardik Patel's Facebook page. Shehzad Poonawalla is a lawyer-activist and founder-member of the governing body of the think-tank Policy Samvad.